Key West is one of the most fascinating and unique cities in the United States. Located at the very tip of the Florida Keys, the city is tropical and the atmosphere eclectic. Famous writers, artists, and musicians have all called Key West home. The storybook architecture and carnival-like atmosphere contribute to the overall relaxed ambiance. Many homes, boats, and businesses in the Florida Keys were badly damaged by Hurricane Irma in September 2017. However, Key West received less of a hit by the hurricane, and most businesses and tourist sites were open within a few weeks. The Keys first became readily accessible in 1912 when Miami's Henry Flagler built the railroad line to Key West. A hurricane destroyed the tracks in 1935, and the railroad line was never rebuilt. Today, the 123-mile Overseas Highway with 42 bridges links the Keys to the mainland. Although the Keys are within an easy drive of Miami, the city has managed to stay a mixture of New Orleans, the Caribbean, and just plain fun. The drive from Miami to Key West is one of the most scenic in the United States. However, it's also a great city to visit from a cruise ship traveling to the Caribbean. 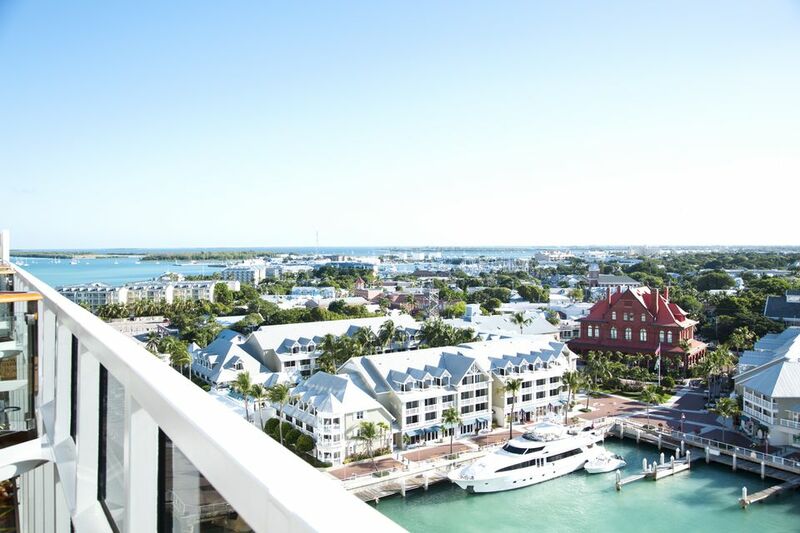 Key West is certainly an easy port of call for cruise passengers to navigate. Cruise ships can dock near Mallory Square, the most important park in Key West, or at nearby Truman Annex. All of the shops, restaurants, and bars on Duval Street and Whitehead Street are within an easy walking distance of the ships. When you only have a day in port, it's important to use your time wisely. Many guests find a bar and just enjoy the relaxed Key West atmosphere. Others enjoy strolling the streets and checking out some of the interesting shops. Those who want to experience some history and have a photo taken at Key West's most photographed site (not Jimmy Buffett's) should visit these three sites. The Truman Little White House and the tourist trams are both within an easy walking distance from Mallory Square. President Harry S. Truman made 11 trips to this old home at the Key West Naval Station and often used it as a place to get away in the winter to work and avoid the weather in Washington, DC. Today the Little White House is a museum. It's an interesting place to visit for those who love learning more about the U.S. presidents and politics. The most famous resident of Key West was probably the writer Ernest Hemingway, who lived in a lovely old house, which is now called the Hemingway Home, in the heart of the town for about ten years. Hemingway and his wife Pauline moved to Key West in 1928, and he continued his habit of writing in the early morning hours and then exploring the town (and bars) later in the day. Soon after moving to Key West, he discovered the joys of deep sea fishing, which was very popular in the area. A tour of the home is a step back to almost 100 years ago, and seeing Hemingway's office, the famous swimming pool (the first in Key West), and the 6-toed cats who still inhabit the grounds is a great way to spend a few hours. A trip to Key West isn't complete without a photo standing in front of the southernmost point in the continental United States. There's usually a line, but it moves fast. The Trolley Tour bus or Conch Train both have a stop near this point, so hop off and take a photo. Cruise ships offer tours to many of the highlights of this lovely tropical town, but the best way to see Key West is aboard the Old Town Trolley and Conch Tour Trains. The hour-long ride takes you all around the important sites of Key West, including the Hemingway House, Southernmost Point of the U.S., Harry Truman Little White House, and Duval Street. The trolley/train covers over 14 miles of old Key West and is narrated with entertaining stories about the city. Walking or biking the back streets of Key West is also a good way to tour the small city. An organized tour is not really necessary to enjoy Key West, but the ​Old Town Trolley ​and Conch Tour Train are both certainly entertaining!